What is a Glide Screw™? 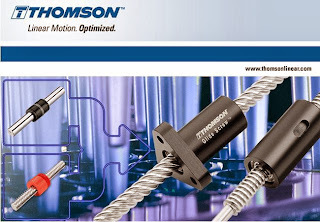 The Glide Screw™ is a breakthrough innovation from Thomson. We have combined the features of a linear bearing and a lead screw into one compact package. The patent-pending Glide Screw™ brings to you three tangible values: reduced footprint, improved equipment uptime, and lower cost of ownership. Reduced footprint: Fewer components! – Integrated lead screw and linear bearing with no additional guidance needed. Improved equipment uptime: Screw and linear bearing are already aligned. Easy to install: Minimal prep time makes the install process fast. Minimal maintenance: Integrated Thomson Lube-for-Life lubrication block. Custom configurations available: Special nuts, screw diameters and thread leads available to accomodate your specific application. The Thomson Glide Screw is genuine innovation, unique in motion control, and available now. To learn how your next machine design can benefit from this new technology, call Thomson or click below to get complete technical infomation and downloadable 3D models.